Born and raised in Los Angeles, Tricia grew up in Taipei and went to college and graduate school in the United Kingdom. She currently lives in New York City. Tricia isn’t “fashion-forward” or the most stylish person out there, but she enjoys putting a “good” outfit together - a “good” outfit that provides her with comfort and confidence. She likes to mix textures and be creative when it comes to styling the same pieces in different looks for various occasions. Tricia is also a travel addict who is fortunate enough to see new places every now and then. Above all, Tricia simply loves sharing what has made her day - whether it is a cute pair of packable shoes that turns out to be a lifesaver or a beautiful scene she came upon unexpectedly. 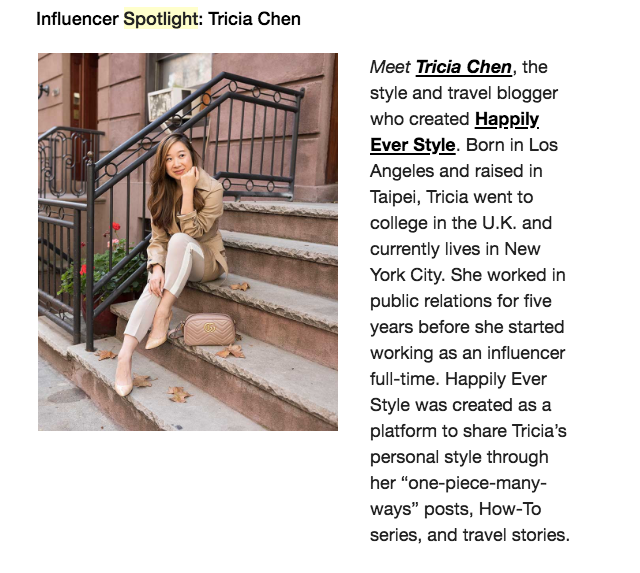 Tricia is also the founder of Once Upon, a New York City-based influencer marketing agency. For collaboration opportunities, please email Tricia at tricia@happilyeverstyle.com. Happily Ever Style is a space where Tricia shares her personal style through her how-to series, #realoutfits, travel stories, and beauty tips! Special thanks to my friend Annie Chang (@moments.byannie) for designing Happily Ever Style's logo.